Understanding of charge transfer processes in an organic crystal (OC) sandwiched between two metal electrodes is a central issue for fundamental physics and device applications. In a recent Journal of Physics: Condensed Matter Paper, Leonid Govor and his team studied gold-squaraine-gold structures, revealing how hole extraction determines devices properties. Read on to find out more from the authors themselves. Tunneling of charge carriers through two interfaces in metal-OC-metal structures has a large influence on the electronic properties of organic electronic devices. For a proper analysis of charge transfer through an OC sandwiched between two metal electrodes, we need to understand not only the process of how charges are injected, but also how they are eventually extracted. In our recent paper, we examined the variations of resistance at the injecting and extracting interfaces in squaraine (SQ) single crystals as a function of the voltage applied, and their influence on charge transfer through a metal-OC-metal structure. For SQ crystals with four gold electrodes, we investigated the charge transfer between the injecting electrode 1 and the extracting electrodes 2, 3, and 4. 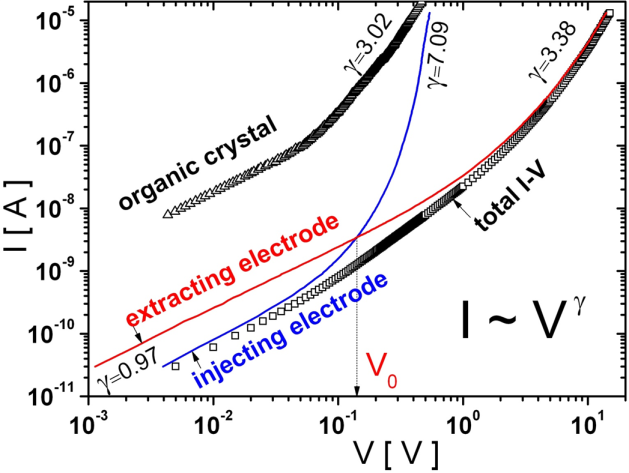 We decomposed the total current-voltage characteristics measured for the gold-SQ-gold structure into three components, representing charge transfer through the injecting electrode, the SQ crystal, and the extracting electrode (figure). Adapted from J. Phys. Cond. Mat. 29 025001 © IOP Publishing 2016. All rights reserved. We found that the different values of the contact resistances measured at different electrodes are related to differing values of the barrier height and its width d, which were determined using the Simmons approximation. When the extracting interface has a larger contact resistance compared to that of the SQ crystal and that of the injecting interface, some of the injected holes remain located within the SQ crystal. The holes stay located within the organic crystal due to the blocking action of the extracting interface, but not due to the existence of traps in the crystal. Consequently, by tuning of the extraction process, one can achieve an essential improvement of electronic properties of organic electronic devices. 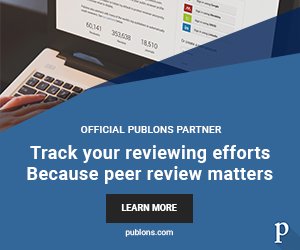 This study was carried out by the Energy and Semiconductor Research Laboratory at the Institute of Physics, Carl von Ossietzky University of Oldenburg, Germany in collaboration with the Institute of Physics, University of Freiburg, Germany. L Govor is experimental physicist with emphasis on charge transport in semiconductors and assistant professor at the University of Oldenburg. J Parisi is experimental physicist, leader of the laboratory, and a full professor at the University of Oldenburg. G Reiter is experimental physicist with emphasis on the physics of the organic crystals and is a full professor at the University of Freiburg. This work was financially supported by the Deutsche Forschungsgemeinschaft under grant numbers GO 2098/2-1 and RE 2273/6-1.